ST@ND is an abbreviation of ‘SEEKING together at New Dawn’. Everything we do is based around promoting fellowship with others and it is through this that we seek to achieve our aims & objectives, which are. to Support young people and give them a solid grounding in their young lives. to Evangelise in a way that is relevant and in touch with the modern day child or teenager. to Encourage the building of relationships and long lasting friendships. to Keep children and young people entertained in a safe and friendly environment. to Introduce our children and young people to Jesus Christ and show how a life with Him at the centre, will be overflowing with purpose and fulfilment! to Nurture an awareness of the dangerous influences that can affect a young person’s life. to Guide and help young people through their early years and to instil solid moral values that will stick with them as they move into adulthood. We are always SEEKING opportunities to meet with new young people and invite them to come join with us! 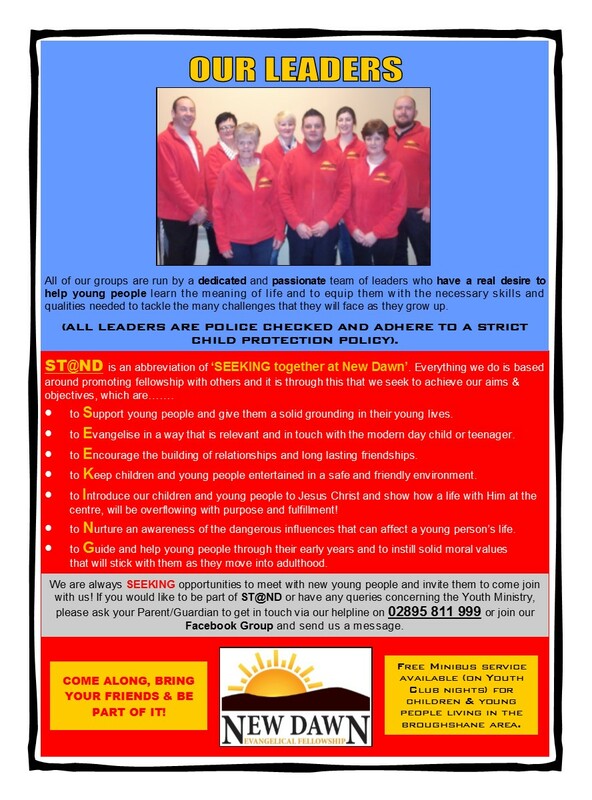 If you would like to be part of ST@ND or have any queries concerning the Youth Ministry. Please ask your Parent/Guardian to get in touch via our helpline on 02895 811 999 or join our Facebook Group and send us a message.